In this instructable I’m going to show you how to make your own PIC18 development board that features both Ethernet and Full Speed USB 2.0 at a low cost.Features:The development board is based on a PIC18LF4553 microcontroller. 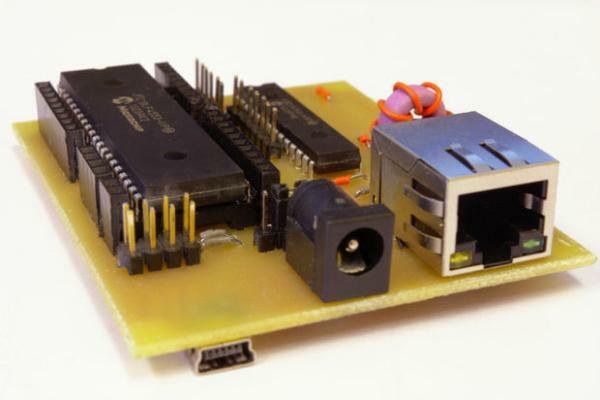 The microcontroller features a Full Speed USB 2.0 (12Mbit/s) interface without the need for any external components. Also, it has 32KB of program memory, 2KB of RAM and it supports an external clock up to 48MHz, which is optional because it also has an 8MHz internal clock. The ENC28J60 Ethernet controller is used to provide Ethernet connectivity to the microcontroller thought the SPI interface. The ENC28J60 has an integrated MAC and a 10Base-T PHY, 8KB of buffer RAM, supports both Full and Half-Duplex modes and it is fully compatible with 10/100/1000Base-T networks. The microcontroller is not soldered directly on the PCB but mounted on an IC socket. The advantage of doing this is that when you are done with the development of the code and you want to make a prototype, you can just pop the microcontroller out and make a new PCB with only the components you actually need for your project.